A great page (page 14) from Jack Kirby's Fourth World run at DC. 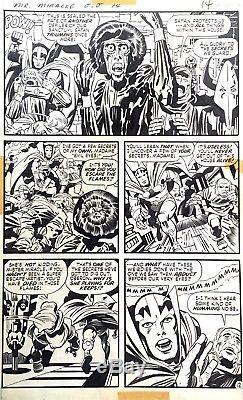 These pages are VERY hard to find these days, and there is NOTHING like a Kirby page. The page is in terrific production condition. Please note some yellowing along the edges from tape removed during print production. The line work itself is clear and clean. The item "Jack Kirby Original Art Mister Miracle #14" is in sale since Sunday, June 24, 2018. This item is in the category "Collectibles\Comics\Original Comic Art\Interior Pages". The seller is "davidms" and is located in Newton Center, Massachusetts. This item can be shipped to United States.